At what point do we have to stop running from our past and begin looking towards the possibility of a shining future? Your Lie in April explores this question with earnestness, presenting a heartfelt drama about the power of love, loss and music. Kosei Arima was a piano prodigy, dominating the world of piano under the tutelage of his taskmaster mother until her death robbed him of the ability to hear the piano’s sounds. Years later, Kousei lives a life in monotone until meeting unorthodox violinist Kaori Miyazono. Shaken by her enthusiastic attitude, Kosei finds himself being led right back into the world of piano by the violinist. Anyone interested in music will find plenty to enjoy here, as well as readers looking for a dramatic story of love and finding one’s self. There’s something to be said about a story that gets right to the point, and Your Lie in April Vol. 1 certainly accomplishes this by efficiently laying out the main direction for the plot. I enjoyed that Arakawa wastes no time in getting readers to empathize with Kosei’s situation and delivers a good amount of story progression in this volume. The pacing felt just right, neither overwhelming or boring the reader. I felt that this volume does a great job establishing Kosei’s character, which is extremely important considering the series is primarily driven by his personal struggles. Kosei’s inner thoughts are expertly portrayed and add a good deal of dramatic emphasis to each scene. This was especially effective during the performance scene in this volume as Kosei’s thoughts help to convey information to readers about the performance while also elucidating his personal world-view. I felt instantly connected to him as a character, making me that much more invested in his overall personal development and is important considering this is the main emphasis of this series. 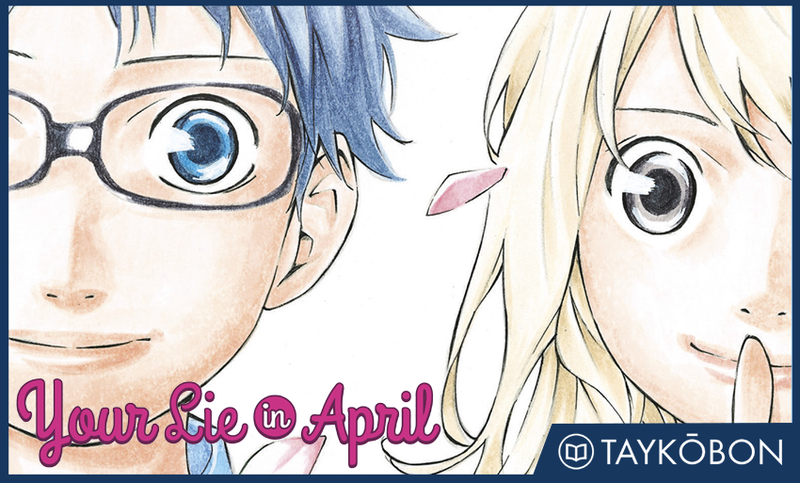 As one might expect from a series that features music as a central element, Your Lie in April Vol. 1 incorporates music expertly into its artwork. The performance of the “Kretuzer Sonata” was a particular highlight in this volume as Arakawa’s artwork effectively portrays the force and flair present in the performance. Although we can’t hear the piece being played, the artwork still conveyed the performance as well as possible in this medium, helping to immerse readers into the performance. I enjoyed the manner in which the main romantic subplot was set up, as it did not try and force the issue while providing a solid basis for growth between Kosei and Kaori. While we aren’t privy to what makes Kaori tick as of yet, Arakawa deftly conveys the effect her initial impression has on Kosei as a catalyst for his character development. I felt this was especially enjoyable because it helped to get me invested in their interactions as well as the character changes Kosei displays within the context of this volume. Arakawa’s artwork is inconsistent at times in this volume, occasionally jarring the reader. The artwork during Kaori’s performance was top-notch and beautiful to look at, but during other smaller scenes the quality drops off considerably. This is most noticeable in Arakawa’s character designs as inconsistencies appear at times. Kaori in particular is most affected by this issue, but it is by no means a crippling issue as the art is more than serviceable during the majority of the volume. The humour is hit and miss, comprising primarily of exaggerated physical comedy at Kosei’s expense. It got to be a bit much, and hopefully it will be toned down in future volumes. Your Lie in April Vol. 1 is a compelling opening for the series, drawing readers into Kosei’s struggle to return to the world of music. The volume did a great job at establishing Kosei’s character as well as the overall direction of the plot. The performance scene was a particular highlight as I felt it showcased a wonderful intersection of style, drama and artwork to advance the plot. This series should not be missed by anyone looking for a powerful story about coming to terms with oneself through the power of music, and this volume is an excellent and promising start to the series. Your Lie in April (Shigatsu Wa Kimi No Uso) Vol 1. was published by Kodansha Comics USA on April 21st, 2015. The series originally ran in Kodansha’s Monthly Shonen Magazine from 2011-2015, with an anime adaption by A-1 Pictures airing from October 2014 - March 2015. The next volume will be released on June 23, 2015. Your Lie in April was named one of our best new series from 2015, check out the rest below!